The latest uniform and shoe updates will now automatically update in your MyCAREER/MyLEAGUE/MyGM saves. Updated action photos for players who did not have one / had one from their previous team. A number of players have received new Face/Hair/Tattoo updates. Check out LeBron’s brand new face scan! Users who reach the highest level shoe endorsement will no longer need to purchase their custom created On-COURT shoes. The All-Star game should now properly appear on the schedule for the current season when starting a new Start Today mode. Users are now able to schedule practices in the first season of a Start Today mode (fixes the case where players would experience declining ratings after the first season). 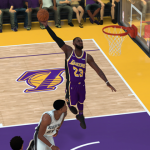 Fixed an issue where some users were reporting game disconnects during timeouts of MyLEAGUE Online games.